I live in The Gambia. The Smiling and Sunny Coast of Africa – The land of beaches, a river and abundant sun… well, that’s if Global Warming doesn’t have its way. Most common buzz words heard these days - Global Warming, Greenhouse Gases, Carbon Footprints, Renewable Energy, Climate Change etc. keep echoing in our ears. The moment there’s an unscheduled rain, or an extremely hot or cold day – most of us turn into environmental experts – “its Global warming” is the immediate synopsis. Well, it took me a long time to understand these terms. I couldn’t figure out how Global Warming could make us feel cold. How it caused floods. How cattle could influence global warming. But today I am wiser. I ask sensibly, ‘Is a candle eco-friendly?’ Is holding a conference on Global Warming in Denmark, with 15,000 delegates, each one liberally burning carbon to get there, an ideal method to discus reduction of emission of greenhouse gasses? I, and probably 99% of this worlds sensible netizens have slowly but surely realized that Global warming is something that will not go away easily. Yet most of us don’t do anything about it. Me included. And my tryst with eco-friendliness happened by chance. It was, when, as a partial diplomat, I was on one of my trips to India, my second home. (The Gambia has been my first home since 1998). I was browsing the markets (the old fashioned way - taking flights, making telephone calls, riding taxis, calling friends etc). I was looking for appropriate rural technologies that we could bring from India to Africa. I did find some innovative water purifiers and leaf cup and plate making machines. And this was when I stumbled upon a Solar Task Light. To be honest it was the Solar Task Light that stumbled on me!! It was given to me as a gift. A SOLAR TASK light? Barely understanding what it was, I almost left it behind as an unwanted bulky, vital-airline-baggage-allowance-consuming TORCH. A last minute power cut while packing my bags in Chennai, reminded me of our unscheduled power cuts in The Gambia and the TASK Light found a place to snuggle in my luggage. Back in The Gambia….. Voila, the first power cut back at home and out came the ZonLight. And it did save us that night. What surprised me even more was that this gadget was still ‘ON’ when we woke up in the morning.....after 9 hours!!! Noticing the Solar panel on the Yellow object, I figured out that I had to get it into the sun to charge. (Remember – for want of baggage allowance, I'd left the operation manual and the carton in India). I left it out in the sun. In the evening I noticed that it had started flashing like a camera flashbulb. Worried, I returned my ZonLight to the safety of indoors. That evening, after waiting eagerly for the sun to leave, I put it ON at night once again, inquisitively, waking up at hourly intervals to see if it was still on. NAWEC didn’t go off that night – and neither did the ZonLight. The results were the same. Almost 10 hours of Light this time.!! I then did the first thing I did with all my toys in my younger days ... I took it apart. Fiddled with it until it didn’t work!!! ...well at least I thought it didn't work. I now needed to find out how I could lay my hands on another and there started my quest to get in touch with the manufacturer. What energized my search was that on another day I was actually able to put all the pieces back together and VOILA it worked again. I had become hooked onto the amazing piece of technology I was holding. And thereby started my tryst with ZonLight and “Eco-friendliness”. To get to the point of this long story, I now import these ZonLight Solar Task Lights. Together with Intelizon's Kushant Uppal, I see a great potential for these simple solutions in the dark unlit corners of the globe. Kushant Uppal, the founder of Intelizon is a dreamer. (An alumnus of the Indian Institute of Technology, Madras, he quit a luxurious life in the US after 20 years and returned to India. Guided by his mentor Professor Jhunjhunwallah (a known science thinker and someone who has consulted the Indian Presidency on solar and renewable sources of energy), Kushant decided to something for India’s rural areas that were devoid of light. Working without major NGO support, in India he has developed a mechanism using microfinance and a marketing team, to deliver his products to remote villages. However, here in Africa, sustainable and workable micro finance does not exist, and thus has made our task of direct selling quite different. However NGOs, Governments and Corporates have a far freer hand in spending and thus our task here is seems to be to channel NGO funding and Corporate SOCIAL Responsibility into a distribution segment. We are together looking at making this a larger story. We have received a lot of encouragement from NGOs like CRS (Catholic Relief Services) and Riders for Health and most recently from the Ministry of Energy and the Government of The Gambia. PURA has been very encouraging and have showcased our ZonLights. Corporate sponsorship recently has kick started a Light up a Village campaign which we, ComAfrique have been proud to initiate. TATA Africa are on board too. More information is provided below. Intelizon, initially commenced with 3 basic products for the Indian market. Ever since we have looked at Africa, we have requested models that adapt to African situations and markets. ZONLIGHT (BASIC) - a 5 LED( Light Emitting Diode) SOLAR TASK Light. Why is called a TASK light – Because it permits you to use it for many ‘TASKS’. The Light is not concentrated and thus spreads, making it different from a Torch. Hung from the ceiling with the strap – it acts like a room bulb. Strapped around your body helps you do work with your hands free. Use it in a shop or your workshop as a light. You can even use it as a torch! Thus this is a TASK Light. The ZonLight Basic uses a small compact Lithium-Ion 450-500mA Battery (Like your Cell phone Battery). The ZonLight Basic provides a two stage light that lasts from 7/9 hours on bright mode to 3/5 hours on Extra Bright mode. The battery charges from 6 hours exposure to sunlight from an inbuilt panel. The ZonLight has a carrying strap making it easy to use with your hands free or hang up from the ceiling. It is quite weather proof. It comes with a 1 year warranty. The battery lasts from 1-2 years depending on usage and is easily replaceable. The LEDs and Panel are top quality and last 5 years. The body is moulded hard ABS plastic and is durable. The drop (throw on the ground) test is our favourite selling gimmick. The standard dialogue that follows after dropping the ZonLight with a large sound - and showing that it still works is “SEE its 'Made in India'”. When fully charged if flashes like a flashbulb. And this too is a selling aid. We use this feature for advertising too. At the recent concluded GCCI Trade Fair, ZonLights provided the illumination for TATA – Safari Motors vehicles. ZONLIGHT II - More or less similar to ZONLIGHT Basic model as above, except that it has the following additional features. 1. It has the option of being charged with the grid/electricity and thus can be charged in 3 hours. 2. It has the option of charging a Nokia phone (models like the 1100/1200) using the inbuilt solar panel for emergency talk time. 3. It has a charge indicator that glows when charging. We have devised a model called the ZonLight II Plus: using a 1W external portable solar panel with a 1000mAh battery on a ZonLight II – we now are able to offer the amazing Zonlight with 12/24 Hours of Light with the same charging times. ZONHOME: A truly revolutionary urban and rural use Light that resembles a tube light or an Emergency Light. It also has the Grid and Solar Charging facilities with a 1 Watt Portable Solar External panel (5 metres cable provided). Installation is very simple or not required. The Light is also portable and can be moved around with its Dimmer / On Off switch. On low power, the ZONHOME provides AMAZING 15 (FIFTEEN!) hours of light. And in Full mode provides 'eye-shutting' bright light with 2-3 hours of back up. Connected to the Grid the ZONHOME can be used as a permanent light solution that automatically switches to back up when power goes off. The Consumption is only 6Watts when used with Nawec. It also has the feature to charge Nokia phones via the solar panel. One Year Warranty and robust construction are a standard from Intelizon and ComAfrique. NEW INNOVATIONS being developed are the ZON HOME CHOTA or SMALL with a Single LED giving as much light as the ZonHome Regular. ZONLIGHT III - which can be used as a basic Outdoor automatic switching Light with a sensor incorporated. Floodlights or Streetlights are also being developed on this chassis. ZON STREET LIGHT – has been developed for rural street lighting with a 1700mAh battery and 2 x 1W panels combination that delivers bright light for 10-11 hours with an automatic sensor switch on and off. The light is also more focused using special lenses on the LEDs. The ZonSTREET is an amazing Street Lighting product available almost 75% cheaper than equivalent products in the market. ZON Street Lights are ideal for Gardens, Hotels, Beach Bars, Restaurants, Warehouses etc too. At 7000GMD with a One Year Warranty and 1-2 year battery life – with a 350GMD battery replacement cost – this becomes an effective tool for governments to light up rural areas at low maintenance costs. Zon SIGNBOARD – In a recent experiment we have succeeded in using 3 ZonHome chassis electronics to induct in a 2 meter hexagonal sign board. With the right settings we will be able to have daily illumination for 10-12 hours for 1.5 years. For an equivalent sign board, current systems use 2-4 40 watt tube lights which need frequent replacement. ZonSIGNBoards will save you 50% on your Electricity bills and 100% on your wiring costs. In addition InteliZon is developing ZON POWER, an inverter based system that will revolutionize the Inverter industry. Can't tell you too much since it is a revolutionary idea. The units available are all priced far below any of the CFL products marketed currently and are far longer lasting than any of the LED solutions offered at the moment. An ADDED BONUS FOR AFRICA is that ComAfrique has taken up the assembly of the products in Africa, thus providing green employment as well. 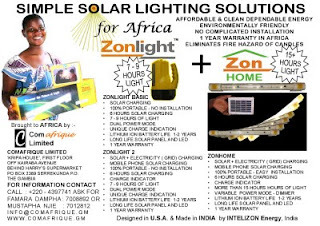 I would encourage more people to invest in these simple solar lighting solutions - AS our advertisement says - LIGHT UP A LIFE - GIFT SOMEONE A ZONLIGHT TODAY. Solar Energy also gives the corporate world an opportunity to exhibit Corporate Social responsibility. When you gift someone LIGHT – you are gifting their families an opportunity. Light means an ability to read and study at night. Light encourages Learning and Learning is the driving force of a Developing Nation. Each Village (of approximately 25 Households Each) will be given at least one or two ZonLights per Household. And Each Village will also be given from 5-7 ZonHomes for their Community Centre, Medical Centre, Village Mosque or Church, Police Station and School. The Lights could be in various combinations to suit each Village. The Value of each Villages sponsorship is approximately 65-70,000GMD. ComAfrique invites other NGOs/Corporates to take up this offer and sponsor more villages in The Gambia. And for any other Sponsor, offering to use ZonLights to Light up a Village, ComAfrique are expanding their offer a little further. They pledge to provide EVERY Village sponsored by any other Corporate using ZonLights, ONE FREE Battery Replacement – thus extending the availability of Light for a total of approximately 3-4 years for each household and each village sponsored by any other department or corporate. And All this with a ONE YEAR WARRANTY. 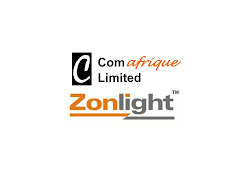 When ComAfrique first offered to sponsor a village with ZonLights and ZonHomes, Mr. Sumeet Tank of TATA Africa offered to sponsor another village as part of their CSR. His Excellency Sheikh Professor Alhaji Dr. Yahya A J J Jammeh, The President of The Gambia, has now benevolently consented to sponsor two more villages in The Gambia. Thus a movement is now on with 4 Villages benefiting from this scheme. The Villages of Jakoi Gibbirick and Battendeng are being sponsored by ComAfrique and TATA Africa/Safari-Motors respectively and the villages of Bujingha and Jiramba are being sponsored by His Excellency. In an attempt to make this self sustainable, the Project will encourage each village to devise means to make this self sustainable. The Corporates will initially sponsor a light or two for each home that will last 1-2 years. The beneficiary villagers will be requested contribute a minimal amount of approximately 1 GMD a day (30GMD per Month to a village Light fund). Therefore, at the end of the two years they have sufficient funds to replace the batteries (175-350GMD) and thereby have light for a further 1-2 years. At the end of the 3-5th year, the village fund has sufficient funds to replace every light. A small sum of 1 GMD per day, will give each household basic light for a lifetime. This is Cheaper and a far more Safer and Better Light than candles. ComAfrique invites more corporates to come forward and Sponsor Villages. The Lights will enhance Education as children can study at night. We would invite UNICEF and UNDP to be a part of this program as well.